Member service is more than just offering accounts and a cup of coffee. Services like gift cards, wire transfers, and direct deposit make life easier. Reorder checks or get a new check design through our partner Harland Clarke. Order through A+ Online Banking, the A+ Mobile app, or Harland Clarke. 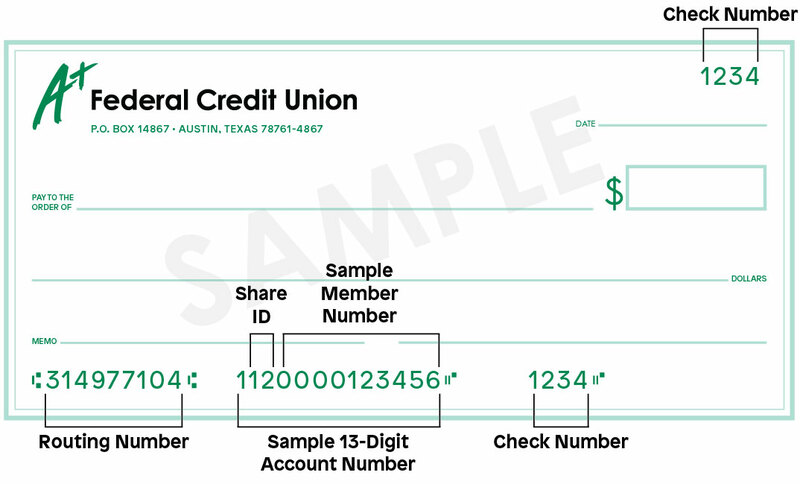 Ordering checks for the first time or need to change your name or address? Please call us at 512.302.6800 or visit a branch. Direct deposit puts your money right into your account on payday without ever having to visit an A+FCU branch. Work with your employer to get started. Need a direct deposit form? Print one by logging in to A+ Online Banking > Services > Direct Deposit form. Payroll deduction lets you to set aside money from your paycheck into accounts of your choosing. As you complete your Direct Deposit and Payroll Deduction forms, you will be asked for information specific to your A+FCU accounts. Your 13-digit account number and share type can be found by logging in to A+ Online Banking. Note about your 13-digit account number: your account number will always begin with a 1, followed by a two-digit Share ID. The final ten digits are leading zeros plus your member number. We can help take the guesswork out of gift giving with a Visa® Gift Card. There is a nominal service charge of $2.95 per gift card. Wire transfers are a quick, secure, and low-cost way to transfer money from one account to another (including non-affiliated financial institutions) within the United States. For outgoing wire transfers, please call us at 512.302.6800 or visit an A+FCU branch. Note: your 13-digit account number will always begin with a 1, followed by a two digit Share ID. The final ten digits are leading zeros plus your member number.